As India undergoes a fascinating process of modernization and transformation, these words from the great American writer are fitting when talking about an ancient country striving to marry its past with its present, maintain its traditions along with championing the cause of advancement, and uphold its unique identity without turning its back on the increasingly mall-like environment of the globalizing world. The marriage between tradition and modernity has already occurred in contemporary India and the wedded state of these two is sometimes rocky or tumultuous, like I suppose is the state of most marriages in their early years. Still, one thing definitely seems to be clear: the country does not want to give up the old or the new. Consequently, be it social mores or cultural expression, contemporary Indians are forging tradition and innovation to create new entities, those that are more than the sum of their parts, those that infuse Indian culture with contemporary and worldly perspectives, knowledge and technology. The past is being kept alive, even revived and acknowledged in ways it had not been for years, but in a reincarnated manner to the suit the current moment. 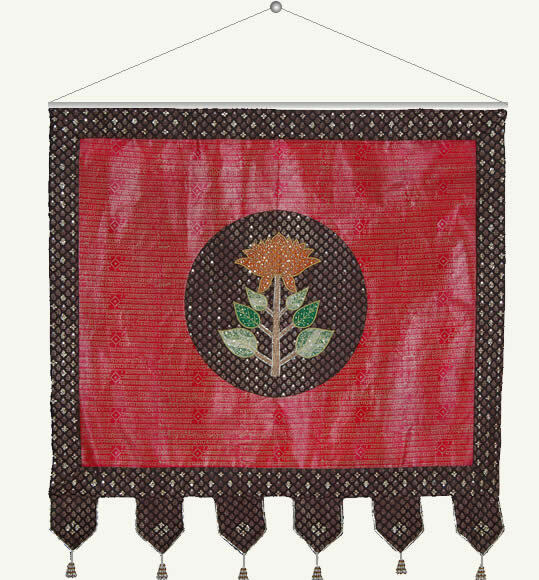 Most forms of Indian art and culture are experiencing a form of hybridization, but that is not to say that traditional forms are being lost. For example, when it comes to music, popular composer A.R. Rahman is blending music inspired by South Indian Carnatic ragas, Sufi melodies and many other strands, including Turkish and Chinese sounds. Younger star Anoushka Shankar, the Grammy-nominated composer and sitar player and daughter of legendary sitar player Ravi Shankar, combines sounds of traditional sitar, electronica beats and flamenco piano, amongst others, to create sensual and sublime contemporary world music. Even when it comes to fashion, Indians, in particular women, are not ready to abandon their saris and salwar kameezes even as they don the global uniform of jeans and T-shirts in urban areas. 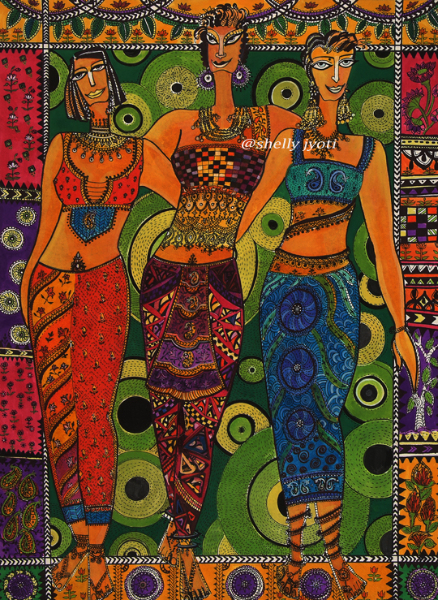 Instead, they are jazzing up traditional clothing in creative and exciting ways by wearing halter or tube top-inspired blouses with saris, kameezes with spaghetti straps combined with see-through salwars, ensembles ready to rival any Western garment with both their sassiness and sexiness, not to mention their alchemy of the highly traditional with the fiercely contemporary. 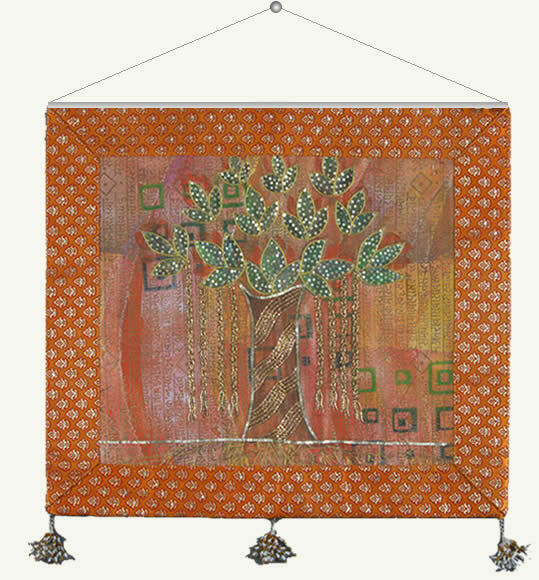 Even when it comes to the visual arts, the old still holds its sway even as it beckons contemporaneity and the world outside. In fact, on any given day, if you go visiting art galleries in New Delhi, India’s capital city, you are likely to find several representations of Hindu Gods, particularly Ganesh, the elephant-headed God, whom I was once intrigued to see in an interesting Cubist rendition. 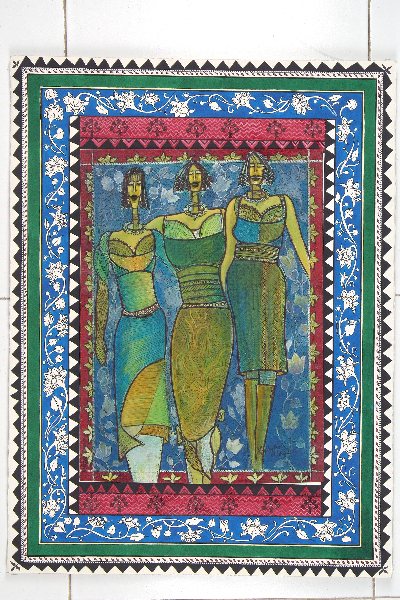 Several contemporary artists such as Nilima Sheikh, Arpana Caur and Manjit Bawa are drawing upon mythological imagery, traditional art forms and folk motifs to create original, cutting-edge art that can confidently stand on the world stage. 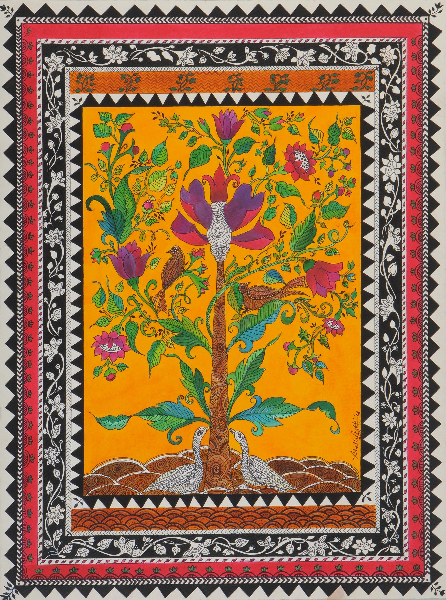 Nilima Sheikh, the renowned painter who has exhibited her work in several countries including the U.S., incorporates different traditional styles, ranging from Japanese Ukiyo-e prints to Rajasthani, Pahari and Mughal miniatures, to create vivid and magical paintings that have strong social and political messages. 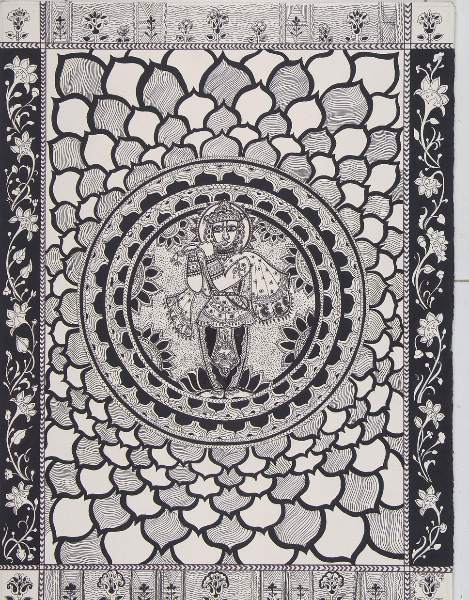 Which brings me to Shelly Jyoti, a fashion designer and artist, whose exquisite paintings exhibited in this show explore decorative elements of various traditional art forms, in particular those of centuries-old Mithila painting, but also ornamental elements of other traditions in an inventive manner that’s entirely her own. 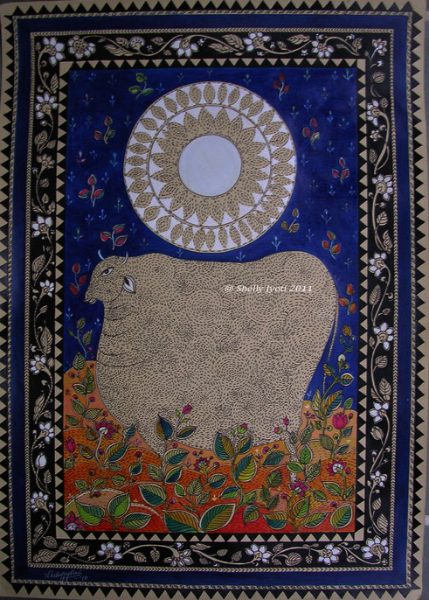 It was in order to create a framework for Shelly’s body of work “Beyond Mithila: Exploring the Decorative” that I took this time to contextualize her work in 21st century India. Without an understanding of what is happening in India where some new alliance is being forged at this moment, where some innovative amalgamation is happening as I write, Jyoti’s work is difficult to fully appreciate, especially since she is one of those actively conducting her own dialogue between the past and the present. 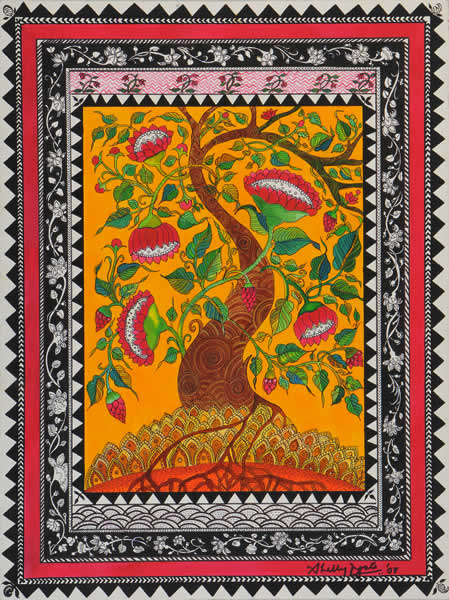 In this body of work, Jyoti takes a great deal of her inspiration from Mithila or Madhubani paintings as they are popularly called, an ancient and popular folk art form practiced almost exclusively by women in the northern part of the state of Bihar in eastern India and centered around mythological, folk, and tantric themes. 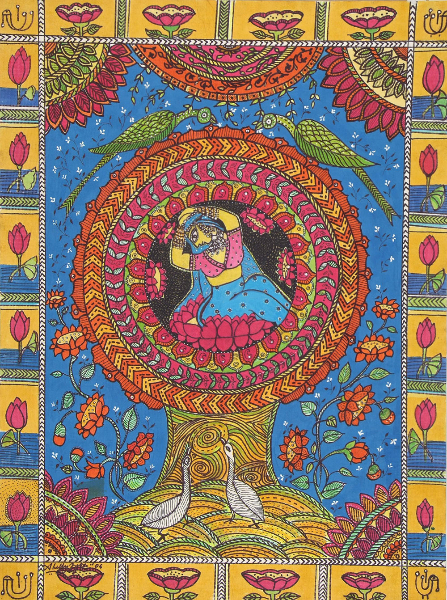 Mithila art is filled with symbols of fertility and prosperity like the fish, elephant, sun, moon, bamboo tree and lotus, and the colors, extracted from vegetable pigments, are bright and cheerful: green from the leaves, yellow from the turmeric plant, reddish-pink from the beetroot plant and orange from flowers. 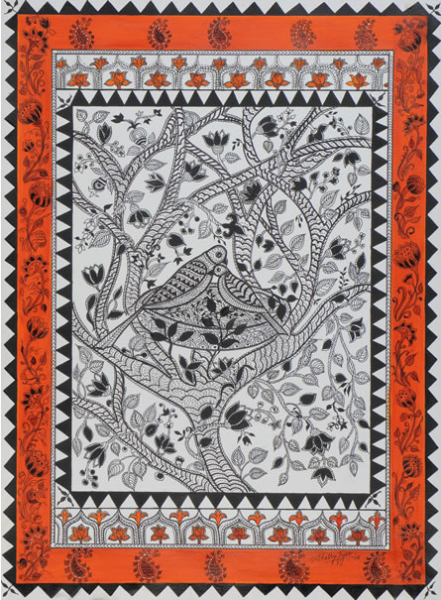 While aspects of Mithila tradition are drawn upon in this decorative series, recognizably so, in Jyoti’s paintings, they are reinvented and augmented in a way to create works that are exuberant, intricate, wellput together and very exemplary of 21st century India. 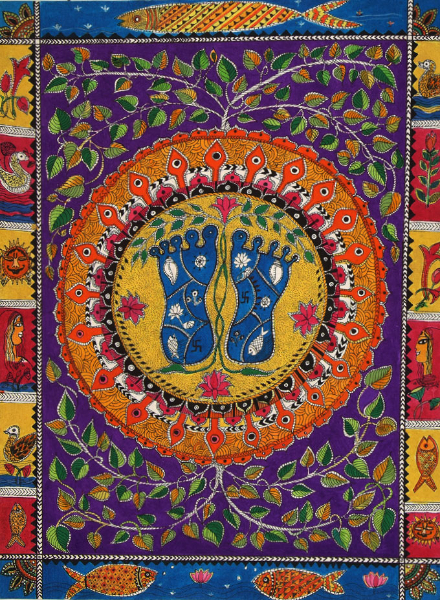 Not only does she use elements of Mithila painting, but she also takes inspiration from diverse decorative traditions from India and beyond, including a Persian embroidery known as zardozi from the Mughal era, a running stitch called kantha practiced by women from Calcutta in eastern India, and different Chinese embroideries. 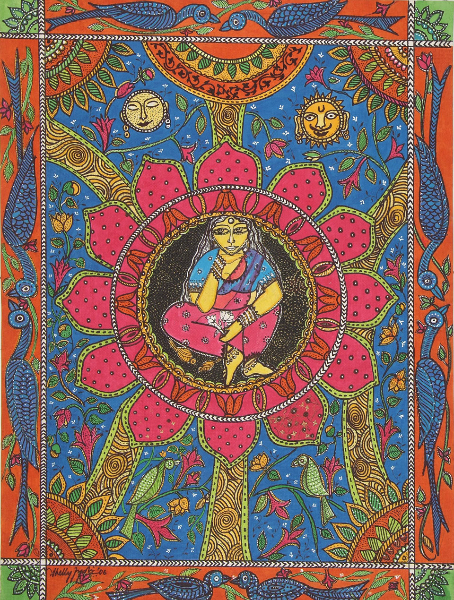 All of this is creatively resurrected and fused by Jyoti, who is guided by form, agnostic of source, forging her own brand of heterogeneous and ornamental paintings that are truly beautiful in a classic sense of the word. 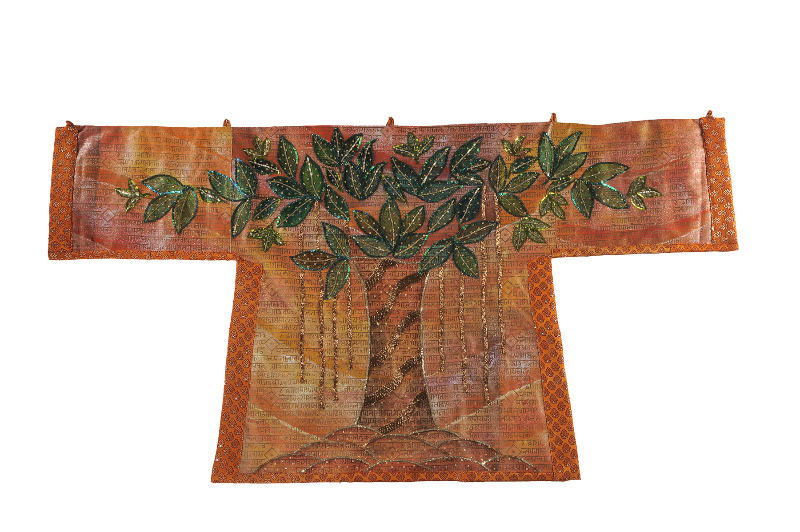 A designer as well, Jyoti says each garment she designed is, to her, like a piece of jewelry and these paintings, with their winding floral borders, intricately-patterned birds, and sumptuous pink lotuses, also look like pieces of jewelry. On a final note, I’d like to mention how refreshing it will be to see such joyful and pleasurable art in the U.S. where decorative art, like in most contemporary art circles in the West, has been, for the most part, viewed in a dismissive light, and, consequently, kept out of serious contemporary art venues. 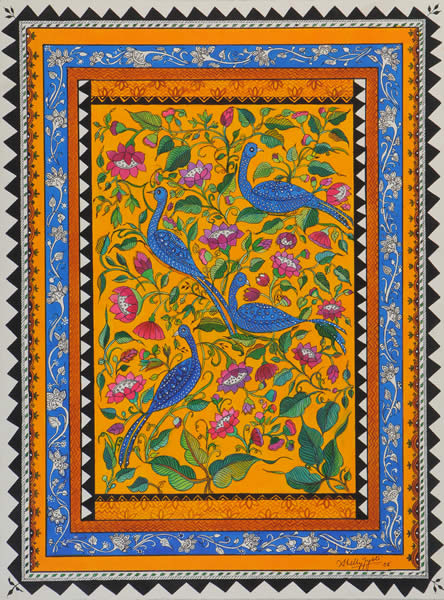 The one time in recent U.S. history where decoration did have its day was during the pattern and design movement in the 70’s where artists like Kim MacConnel, Joyce Kozloff, and Miriam Schapiro, influenced by feminism and non-Western cultures, distanced themselves from dominant, high-brow styles like modernism and minimalism and embraced everything from Islamic textile designs and Mexican tile patterns to materials like laces and ribbons, bridging the gap between high and low art, between the Western and non-Western world, and created works that were totally postmodern in their blurring of boundaries. 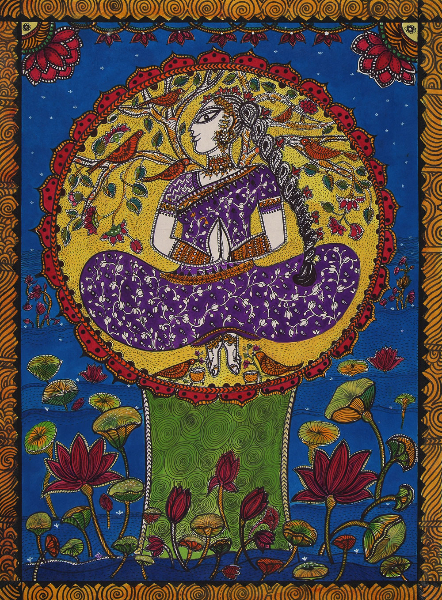 While, unfortunately, decorative elements are sparsely used amongst contemporary artists working in the West right now, lovers of the ornamental in the U.S do have a wonderful opportunity to see Shelly Jyoti’s bountiful paintings in Chicago this winter.